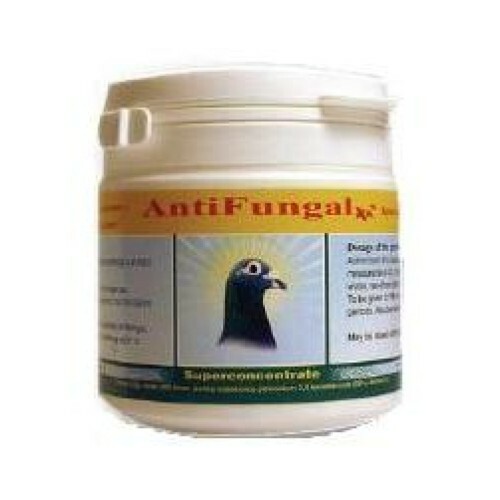 Anti Fungal 125gr by Pigeon Vitality has been developed to solve the problem of stress, fungals, bad growth of feather. After antibiotics cure, the natural micro flora in the birds is destroyed, AntiFungal avoids that. - 2,5 gram per 5 liters of drinking water (100 pigeons). 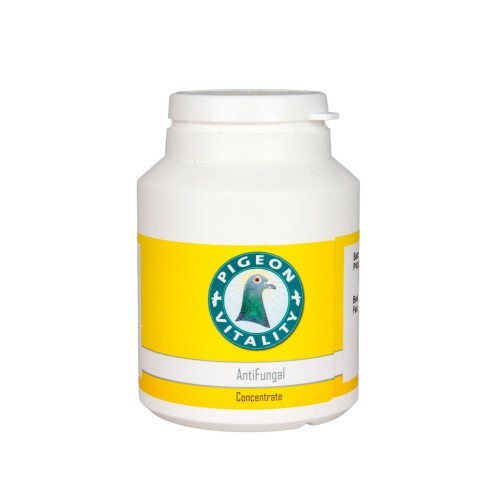 2 AntiFungal sachets of 100gr can treat up to 100 pigeons during 6 months or 100 young birds for a year! Product Plan during Racing Season. - Sunday, monday: 1 to 2 measure spoon of Improver & AntiFungal in 5 liters of water (for 100 Pigeons). - Wednesday: Clear water with Multi-Vitamins. Everyday: Half a measure spoon of Improver & AntiFungal in 5 liters of water (for 50 couples).